Now that the temperatures are starting to heat up here in California (sorry, East Coast), I’ve been craving meals that are fresh and light, as opposed to rich and comforting. The most recent one that I’ve tried – and fallen completely in love with – is this delicious Italian Chicken Bruschetta. Let me tell you, it’s seriously delicious. There’s nothing too complex about it – just fresh tomatoes, basil and garlic. It’s incredibly easy to make. Even though this Italian Chicken Bruschetta is easy to make, the flavors are refreshing and bright but still complex. There is something about the way the fresh and juicy tomatoes work together with the bright basil and the bold garlic. The ingredients are simple and readily available, but the flavors are just perfect. I added some grilled chicken breast to mine. I love adding chicken breast as a lean protein. It’s low in points, so it’s the perfect way to add some protein to my meal without going over budget with my Points. Chicken is also so versatile. You can make this with leftover roast chicken, grilled chicken, broiled or just some chicken breast that you’ve pan fried up just for this. I’ve grown basil before, and this Chicken Bruschetta is a great way to use up some fresh basil if you end up overloaded with it. If you don’t grow it, you can find some at a farmer’s market, or even the local grocery store. I wouldn’t recommend subbing out dried basil for the fresh. The flavor of fresh basil is brighter and cleaner than dried. Not to mention the bright green contrasts so beautifully with the red tomatoes and grilled chicken that it ends up being a beautiful dish. One of the reasons that I really have been enjoying this is that it’s so low in Points! I can have my grilled chicken topped with bruschetta and a side of a couple more vegetables. The whole meal is just a couple of points, so I can save some points for dessert, or a couple of pieces of bread to go with my bruschetta. This Chicken Bruschetta makes a magnificent sandwich with fresh, crusty Italian bread and a little creamy goat cheese. Trust me, it’s amazing! (It’s also one of my more favorite sandwiches ever!) The flavors of this are so bold and mouthwatering-ly good. Bruschetta is pretty popular in the US. Especially chicken bruschetta made with chicken, tomatoes, onions and garlic. It’s often served with cheese and bread. But is that the traditional bruschetta? Or is that the Americanized version? The answer is both. Bruschetta is an antipasto dish (starter or appetizer) that consists mainly of grilled bread with olive oil, garlic and salt. However, it’s not uncommon for bruschetta to also include tomatoes, vegetables, beans, cured meats or cheese. Originally, it was used to salvage bread that was beginning to go stale. What are you waiting for? Grab some tomatoes and basil and give this Chicken Bruschetta recipe a try…you’ll be so glad you did! 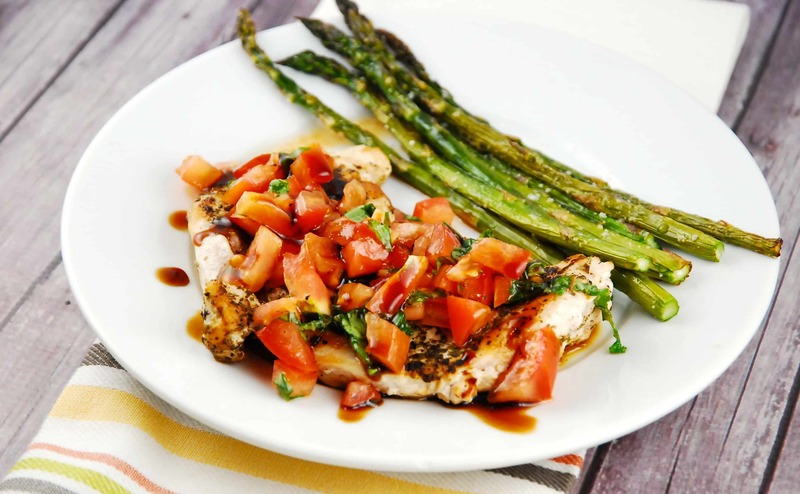 Try these other Italian inspired chicken recipes! Light and refreshing, this simple, yet mouthwatering chicken recipe, is the perfect healthy dinner recipe for a busy day. Cut chicken breasts into 4 equally sized fillets. Season each side of the chicken with the parsley, oregano, and salt & pepper. Heat 1 tsp olive oil over medium high heat in a medium sized, nonstick skillet. When the oil is hot, add chicken, and cook for about 4-5 minutes on each side, or until chicken is browned and entirely cooked through. Remove from heat, cover with a lid, and allow to sit for about 5 minutes to rest. Meanwhile, make bruschetta by combining tomatoes, basil, olive oil, garlic, balsamic vinegar, and salt & pepper in a medium sized bowl. Plate chicken breasts, and top each with about 1/4 cup of the bruschetta. Drizzle on some extra balsamic, if desired. Just FYI, “bruschetta” is not the tomato preparation you described. It’s actually toasted or grilled bread, olive oil, and a topping. Sometimes it’s tomatoes. But it’s the bread. Just FYI. I am having the same problem as previous comments mentioned, only prints photo and paragraph. Having a hard time printing! Just shows picture! Hi Wendy, There is something problematic about the Printer Friendly set-up on your site. It only captures the recipe photo and the introductory paragraph, but not the actual recipe and directions. I have had to copy and paste the whole recipe into Word and then print from there. That said, I love your recipes and make them all the time.